Moscow Robber Caught, CORRIGAN, July 13, 2017 - At approximately 10 pm on n July 12, 2017, the Polk County Sheriff’s Office received a 911 call reporting a robbery at the Valero in Moscow. The suspect fled the scene on foot. A witness, observed the robbery and the suspect fleeing the scene in a truck and contacted the Polk County Sheriff’s Office. The suspect was followed into Corrigan Texas where he went to a residence and was detained by the Corrigan Police Department and Deputies with the Polk County Sheriff's Office. 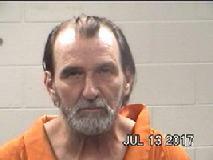 The suspect was identified as Ronnie Floyd Reherd 60 years of age from Corrigan. Detectives arrived on scene and during the search of the residence. Evidence was recovered that linked the suspect not only to the robbery last night, but the robbery that occurred at the Valero on June 26, 2017. Ronnie Reherd is currently in custody at the Polk County Jail charged with two counts of Aggravated Robbery with other charges pending. Ronnie Reherd allegedly robbed the same Valero on June 26.